What Might a $15 Minimum Wage Mean for Philadelphia? Philadelphia is in the midst of an urban revival. In 2017, we experienced upticks in population and home sales and a downtick in unemployment. These trends bode well for Philadelphia’s future, but they mask economic hardship’s persistence within city limits. While Philadelphia’s unemployment numbers have returned to their pre-recession rate, Philadelphians in areas of racially and ethnically concentrated poverty continue to contend with low incomes and their aftereffects like crime and substance misuse. Wage stagnation may be a key player in Philadelphia’s tale of two cities. Our stagnant wages make us a national and regional outlier. While Philadelphia has the highest poverty rate among the nation’s 10 largest cities, we are also one of the few cities on the list that still maintains the federal minimum wage of $7.25 per hour. The other “top ten” cities with the federal minimum wage (Houston, Dallas, and San Antonio) are all located in Texas. Philadelphia’s Northeastern peer cities, like New York ($13.50) and Baltimore ($10.10), have established more adequate wage floors in recent years. Philadelphia’s minimum wage has not budged since 2007. Increasing the minimum wage has emerged as a promising solution for bridging the divide between Philadelphia’s new economy and its longstanding underserved communities. Several studies have linked minimum wage increases to reductions in poverty, income inequality, and social services spending. Since women and people of color are more likely to work low-wage jobs, minimum wage increases also address gender and racial pay gaps. What is more, Philadelphia’s peer cities did not experience predicted repercussions after raising their minimum wages. When San Francisco raised its minimum wage to $15.00 and indexed it to inflation, the ordinance did not produce negative employment effects. When Seattle passed its $15.00 minimum wage phase-in, the ordinance did not produce significant price increases. Raising the minimum wage enables low-wage workers to share in the benefits of the economic growth that they helped engender. In January 2019, Pennsylvania Governor Tom Wolf proposed a $12.00 minimum wage for the commonwealth ─ a measure that would increase the earnings of nearly 70,000 Philadelphians. This is an exciting development. The Office of Community Empowerment and Opportunity believes that Philadelphia is at its best when it fields a full team, promoting conditions that allow all residents to participate in our economic, social, and political life. Making a family-sustaining wage is part and parcel to such inclusion. Throughout 2019, CEO will host a series of dialogues on the requirements for fostering greater economic mobility among Philadelphia’s under-resourced communities through fair wage policies, protection from predatory goods and services, and increased access to asset building opportunities. We hope you will join us. Continue below for additional information on the topic of wage stagnation and check back periodically to sign up for upcoming presentations through our series, Economic Mobility: Earn, Keep, Grow. Close to 15,600 adults living in Philadelphia work full-time, yet live below the poverty line. At the national level, wage inequality is a growing problem, as wages continue to surge for those at the highest income levels while remaining stagnant for low wage workers and those lacking a college degree. Join us for a half-day conference on the importance of fair wages in promoting greater economic mobility for Philadelphia’s workforce. The event will feature keynote speaker Anne Price from the Insight Center for Community Economic Development in Oakland, California, followed by remarks by Mayor Jim Kenney and a panel discussion with local and national experts. Click HERE to see the full agenda and to register! A limited number of scholarships are available for those in need. Send an email to cynthia.rann@phila.gov to apply. PHILADELPHIA – Mayor Jim Kenney and members of his Administration joined thousands across the country in submitting public comments opposing the proposed change to the Supplemental Nutrition Assistance Program, also known as SNAP or food stamps. If adopted, roughly 40,000 Philadelphians signed up for SNAP could lose their benefits. Mayor Kenney called the policy counterproductive. “Taking away food from vulnerable Philadelphians hampers their self-sufficiency and creates additional barriers to finding employment. This short-sighted policy will unethically exacerbate food insecurity in Philadelphia and negatively impact our local economy,” said Kenney. As it is, SNAP requires able-bodied adults without dependent kids to work or engage in job training, and restricts them to three months of benefits every three years if they cannot do so. But states can exempt adults in areas with high unemployment rates from that three-in-three rule. Pennsylvania has sought a waiver from this rule for more than 20 years, under both Democratic and Republican governors. The proposed change would bar states from offering that exemption unless the local unemployment rate is more than seven percent, which would cut an estimated 800,000 people from the program nationwide. The USDA is legally required to read and address every public comment on a proposed regulation. Comments can raise the profile of an issue, help affected communities speak up, and show policymakers that their proposal is broadly unpopular. The Mayor encourages residents to submit their own public comment here. The deadline to comment on the SNAP rule is midnight April 2. A diverse group of advocates, policy makers, public officials, and academics, as well as representatives of landlord associations and tenant organizations convened for the February Shared Prosperity roundtable to hear the results of a study on the cost-effectiveness of providing legal representation for tenants in eviction court. This report estimated that a dollar invested in such a program would save Philadelphia almost thirteen in shelter and health costs for individuals who would otherwise be disruptively displaced. CEO’s Executive Director, Mitchell Little and Eva Gladstein, Deputy Managing Director for Health and Human Services, opened the round table with a reminder of what the stakes were. Forty seven percent (47%) of Philadelphia residents are renters – a number which increased 10% after the 2008 financial crisis and has not budged since – and now evictions are on the rise. Research by Matthew Desmond and others has found that evictions are not just a symptom of poverty but causes it too, leading families already in economic turmoil to seek shelter and support from overburdened friends, family, and city shelters. 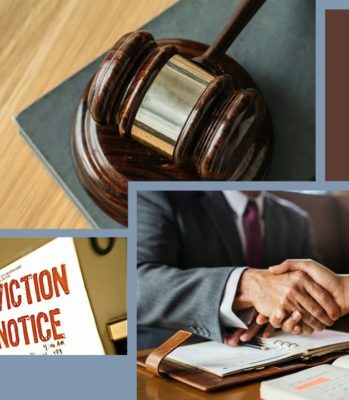 Expanding legal representation for tenants is one of seventeen recommendations made by Mayor Kenney’s Taskforce on Eviction Prevention and Response. 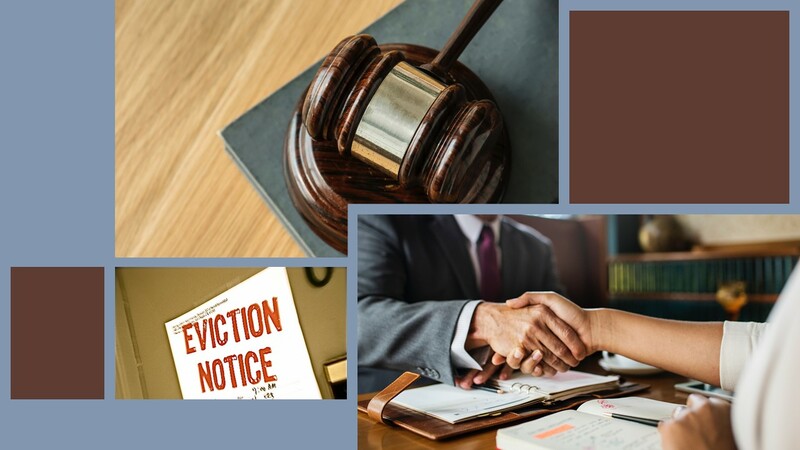 This work, if undertaken, would build upon the foundation laid by the Philadelphia Eviction Prevention Project, which provides some same-day assistance to people in eviction court. The Economic Return of Providing Counsel in Philadelphia Eviction Cases for Low Income Tenants (also referred to as “the Stout Report”), was commissioned by the Philadelphia Bar Association to see if a solution like New York’s current Universal Access to Counsel program would have similar benefits for Philadelphia. 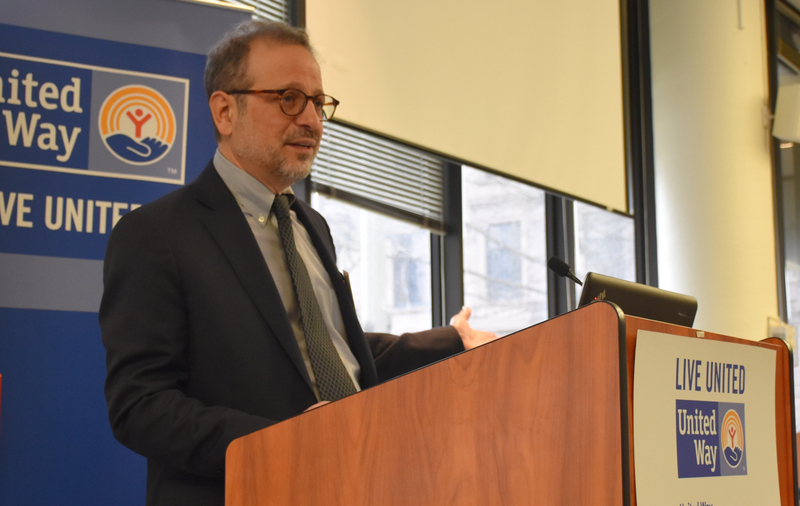 Ethan D. Fogel of Dechert LLP co-presented the findings along with Neil Steinkamp of Stout Risius Ross LLC, author of the report. The two spoke about the report’s conclusions: that having legal council would drastically decrease the number of low-income individuals who undergo disruptive displacement because of eviction. By investing $3.5 million in legal counsel, the city could serve 4,400 low-income clients facing eviction and save $45 million in shelter, medical, and other associated social service costs. 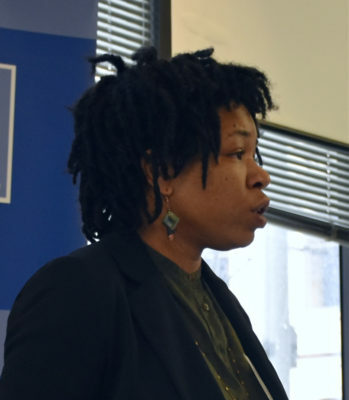 Rasheedah Philips of Community Legal Services of Philadelphia then looked at what legal representation for low-income tenants might mean for Philadelphia. She emphasized the importance of home for low-income families. 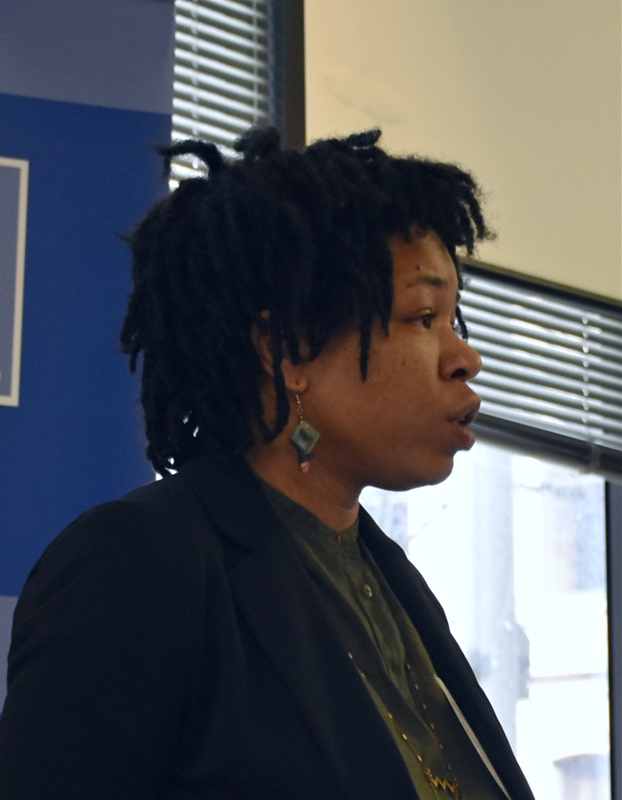 “It’s the only place, they can go after they’ve had a hard day.” She discussed how eviction is often a racial and a gender issue, with a greater proportion of evictions occurring to single, female-headed households of color. And, as a member of the Philadelphia Eviction Prevention Project, how the current free assistance available to these families is not nearly enough to keep up with demand. Attendees had a chance to respond to both keynote speakers. Some voiced concerns about how the most vulnerable would find out about these services. Others brought up suggestions that mirrored other recommendations of the Eviction Task Force, including greater education about eviction resources for both landlords and tenants, and greater opportunities for mediation between landlord and tenant before the eviction filing occurs. Representatives of local landlord associations voiced their concerns that such assistance would be too favorable to tenants at the expense of landlords, and that this might discourage landlords from operating properties in low-income areas. The speakers responded, saying that landlords had something to gain too; that having lawyers on both sides made coming to a stable solution for both parties faster and more realizable. If you would like more information about the issues raised in the February roundtable, you can download the Stout report and the Report of the Mayor’s Task Force on Eviction Prevention and Response at the links provided below. The Office of Community Empowerment and Opportunity (OCEO) seeks to identify community-based multi-service agencies with the capacity to connect low-income individuals, at or below 125% of the Federal Poverty Line, to public benefits. The purpose of this pre-funding request for information (RFI) is to give organizations an opportunity to inform OCEO on their competencies, existing low-income client base, and any additional information that may be relevant to this effort, specifically within Spanish speaking LEP communities. OCEO will select one community based multi-service agency as a Benefits Access Center. The Benefit Access Center will be provided with a screening tool, financial and programmatic support, and training from Benefits Data Trust (BDT). OCEO encourages all entities that may be interested in partnering with OCEO on benefits enrollment to prepare a response to this RFI. The deadline for submission is Friday, April 5, 2019. To download a copy of the RFI, click HERE. The Walk-In Resource Center at the Frankford Library (4634 Frankford Avenue) is person-centered one stop shop, where Turning Points’ social workers and other service providers can assist clients with a variety of needs and life skills, including creating a resume on the spot, putting a budget together, searching for a job, or connecting to other social service providers. The goal of the Walk-In Resource Center is to be able to help a person walk away with a tangible accomplishment. Instead of just giving program participants another flyer or phone number, program staff will walk with them through a process. 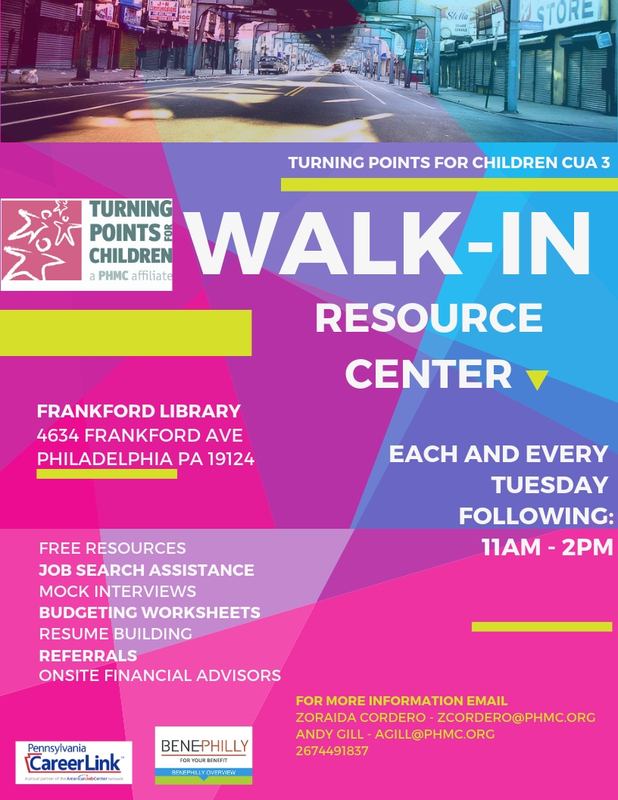 For more information about Turning Points for Children’s new Walk-In Resource Center, download the program flyer here. 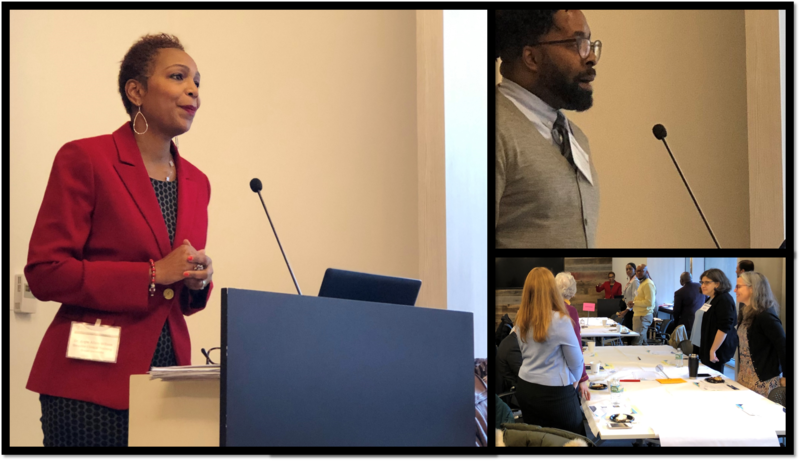 In late November, roundtable attendees gathered to hear updates on the Office of Community Empowerment and Opportunity’s (CEO’s) strategic planning process and to provide input on key strategic priorities as the process continues. The session also included presentations highlighting the themes of racial equity and economic justice. In 2013, CEO took the lead in launching the City’s Shared Prosperity Philadelphia anti-poverty initiative, designed to alleviate poverty’s most immediate effects and provide pathways out of poverty, especially for those facing the greatest barriers. As CEO approaches year five of this plan, it has begun the process of considering what comes next, including reaching out to Philadelphians from all backgrounds to ask for their input. CEO’s Executive Director, Mitchell Little and Dr. Argie Allen-Wilson, Director of Clinical Training, Couple & Family Therapy Department, Drexel University, and Founder/CEO of F.A.I.T.H. Inc., opened the discussion with a call for a commitment to courageous conversations as the first step to leveling the playing field. Dr. Allen-Wilson led attendees in an “Inclusion Revolution” exercise, saying that now is the time to turn to our connection with one another, while honoring our differences, to work towards Shared Prosperity. Next, Mitch Little gave a strategic plan update, thanking attendees for their investment in our work up to this point. He highlighted the plan to shift CEO’s approach from fighting and alleviating poverty to promoting mobility out of poverty, economic justice, and equity. CEO proposes to focus on four key roles under the new strategic plan: advocacy, evidence based programming, convenings, and data and research. 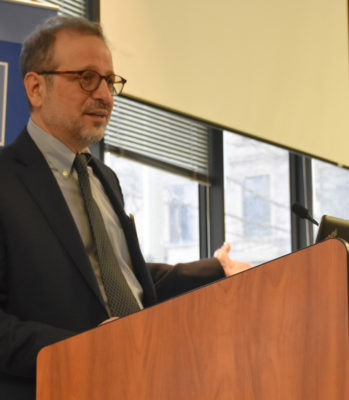 The new direction builds on strengths that CEO has developed over the past five years, and responds to the challenges and changes that have taken place since the launch of Shared Prosperity Philadelphia, including uneven economic growth. What should we keep our eye on? What are the key metrics, trends and potential opportunities/challenges that will define our collective work in the coming year? Given our constraints, what changes in policy or procedures would you prioritize? What realistic city policy changes could have the most positive impact for individuals, families and communities challenged by poverty? Roundtable attendees discussed a wide variety of issues and policies. Several tables suggested that CEO should keep its eye on employment and a living wage, a variety of housing issues, and the opioid crisis. For the second question several tables suggested prioritizing inclusionary zoning, just cause legislation, right to counsel and controlling tax breaks for developers. Other priorities for policy included local hiring, supporting returning citizens, and expanding access to child care, transportation, and healthy food. James Crowder Jr., Senior Associate with PolicyLink, closed out the round table with a presentation on Advancing an Equity Agenda. The presentation helped everyone come to a shared understanding of the concepts of equality, equity and structural disparities, and offered examples of promising equitable development initiatives happening around the country. His presentation also highlighted the National Equity Atlas, an on-line tool developed by PolicyLink that allows users to easily access key demographic and economic indicators by race and ethnicity at the national, state and county level, and across major U.S. cities. CEO’s strategic planning process is expected to be completed in early 2019, with the publication of a final report that will be distributed at a summit to be held in early spring on the theme of economic mobility. We will begin sharing more details about the event in the coming weeks! On October 10, 2018, the U.S. Department of Homeland Security (DHS) issued a proposed revision to its longstanding public charge rule. Section 212(a)(4) of the Immigration and Nationality Act, the public charge rule determines whether individuals seeking legal permanent residence in the United States are inadmissible based on their current or prospective use of public benefits. While the public charge rule has previously penalized individuals who are primarily dependent upon cash assistance like Temporary Assistance for Needy Families (TANF), the DHS proposal proffers expanding the rule to consider any receipt of both cash and in-kind benefits like the Section 8 Housing Choice Voucher Program and the Supplemental Nutrition Assistance Program (SNAP). The estimated impacts of these changes are far-reaching and devastating, especially for vulnerable populations. Experts warn that the revisions will have a chilling effect, in which immigrants will be deterred from enrolling in or will preemptively dis-enroll from essential food, health, and medical benefits. Per DHS, immigrants stand to forgo up to $2.27 billion annually in state and federal public benefits if the proposed rule is enacted. How does the proposed rule work? If revised, the public charge rule will censure individuals who use or are eligible for public benefits in applications to enter the country or to access green cards. The proposal alters the public charge rule’s totality of circumstances test, the series of cumulative factors DHS considers when determining green card eligibility. Under the proposed rule, higher income applicants are viewed more favorably than lower income ones. Receipt of 15% of the federal poverty line in cash assistance for the past 12 months, receipt of in-kind benefits for 12 of the past 36 months, and receipt of both cash assistance and in-kind benefits for 9 of the past 36 months are “heavily weighted negative factors” in the DHS test. Earnings above 250% of the federal poverty line, which is greater than the national median income, is a “heavily weighed positive factor” in the DHS test. Which benefits are included in the proposed rule? The public charge rule currently includes dependence on cash assistance programs like TANF, Supplemental Security Income, and Medicaid long-term care services. The proposed rule broadens the definition to the mere use of both cash assistance and in-kind benefits. Immigrants who participate in SNAP, the Section 8 Housing Choice Voucher Program, Medicare Part D, and most Medicaid services are public charges under the new rule. State-level General Assistance programs are also included in the new rule. Refundable tax credits, the Special Supplemental Nutrition Program for Women, Infants, and Children (WIC), Pell Grants, Head Start, and emergency Medicaid are excluded. While the proposed rule is intended to promote self-sufficiency, it hinders immigrants’ access to critical work supports and reduces their eligibility for green cards, which often serve as a ticket to higher quality employment. Which populations are affected by the proposed rule? DHS estimates that over 382,000 immigrants will be impacted by the revised public charge rule each year. While the proposed rule excludes certain vulnerable populations, such as refugees, asylees, and survivors of domestic violence, it stands to disproportionately impact two particularly high-needs groups: children and persons with disabilities. In penalizing parents who are likely to use public benefits while seeking entry to the United States, the proposed rule hinders both family unification and immigrant children’s access to essential services. Persons with disabilities often rely on Medicaid to access care and on the Low-Income Home Energy Assistance Program to power life-sustaining devices. The proposed rule jeopardizes their health by subjecting them to public review due to their participation in these programs. Advocates for immigrant children, families, and communities can make their voices heard on this issue. DHS will receive comments on the rule until Monday, December 10. To submit a statement, visit the Federal eRulemaking Portal. For more opportunities to get involved, visit protectingimmigrantfamilies.org or paimmigrant.org. To learn more, review the City of Philadelphia’s action guide. In July 2018, the Pennsylvania Supreme Court reinstated General Assistance, a cash stipend that previously served as a lifeline for nearly 70,000 low-income Pennsylvanians. The high court ruled that Act 80, the 2012 law ending the program, was passed despite a procedural misstep within the state legislature. Per the court’s ruling in Billie Washington v. the Pennsylvania Department of Public Welfare, the error voids Act 80, thus allowing applicants to pursue General Assistance once again. As Philadelphia responds to epidemics of deep poverty and opioid use, the program’s renewal is truly a welcome development. Prior to its closure, General Assistance played a critical bridging role in the Commonwealth’s network of income maintenance programs. Its recipients were individuals with substantial barriers to work who were largely ineligible for federal cash transfers. With the modest support of General Assistance’s $205 monthly grant, survivors of domestic violence, persons with chronic health conditions, and users of illicit substances in treatment programs were better positioned to weather trying circumstances. 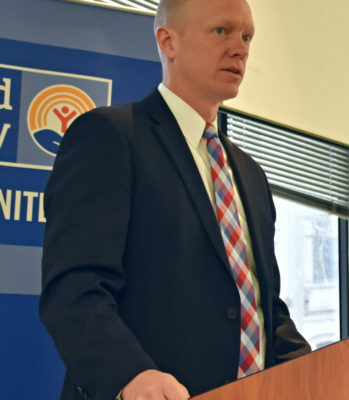 General Assistance’s support also relieved the fiscal strain on agencies that traditionally serve high-needs adults, such as housing and human services providers and state hospitals. 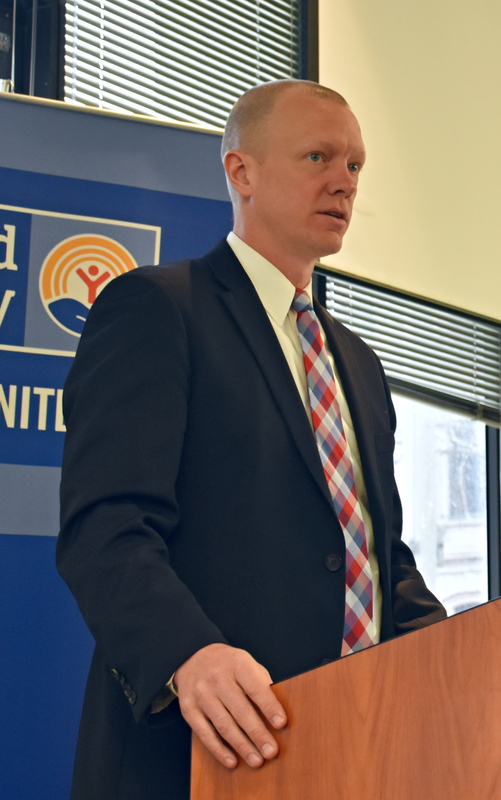 CEO commends the advocates who championed General Assistance and sought the overturn of Act 80. Community Legal Services of Philadelphia, Success Against All Odds, and others have been engaged in a years-long battle on this issue. Their diligent work has furthered the economic security of vulnerable Philadelphians, particularly those seeking a safety net of last resort. General Assistance application are open now via the Pennsylvania Department of Human Services COMPASS system. Visit www.compass.state.pa.us to apply. For application support, contact BenePhilly at 844-848-4376. For more information, visit Community Legal Services.